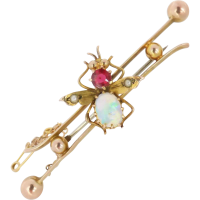 This charming antique opal bar brooch dates back to early 20th century, it is more than likely Australian origin. 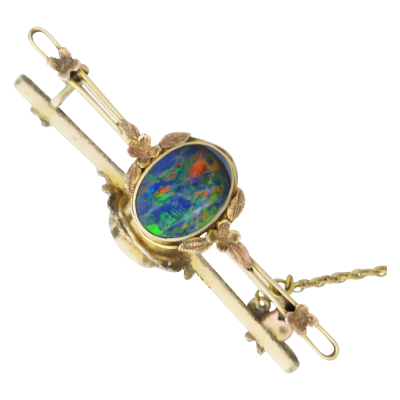 The eye draws towards the colourful opal doublet which displays a strong play of colour, predominantly blue and green along with the full spectral colours seen- bright flashes of orange, red, purple and yellow. 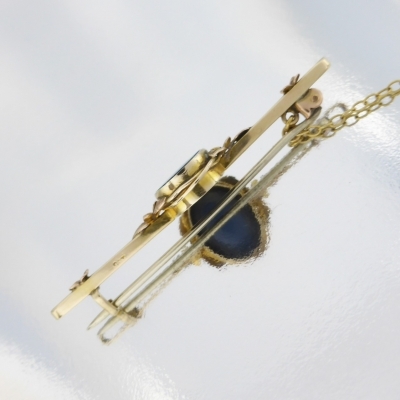 Some whitish vein-like inclusions are seen, the inclusions are more than likely potch, also one opal end displays the potch or backing. 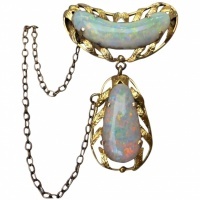 Nonetheless, this opal is a striking and vibrant piece to the naked eye! 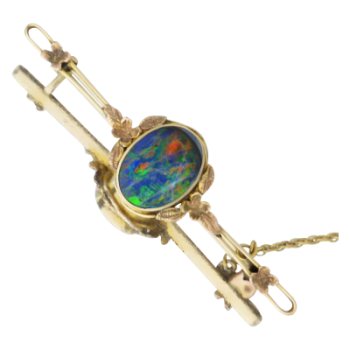 The opal is elegantly presented in an Edwardian mount and hand crafted in 9ct yellow gold. 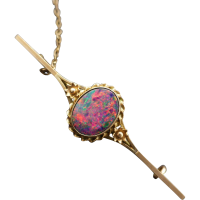 The bar design is reminiscent of the beautiful aesthetic Arts & Crafts movement with naturalistic flower petals, leaf work and flowing wire coiled around the opal bezel setting. 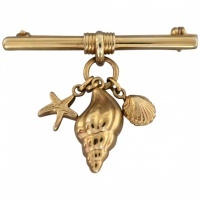 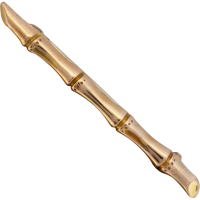 The double bar design is lovely, it is all in keeping with the naturalistic theme of brooch. 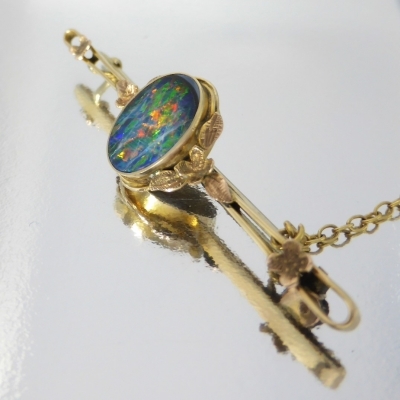 The opal is enclosed into an open-backed bezel setting. 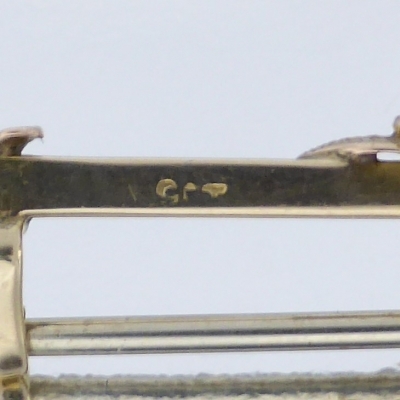 There is a pin and 'C' clasp on the reverse, pin is not gold. 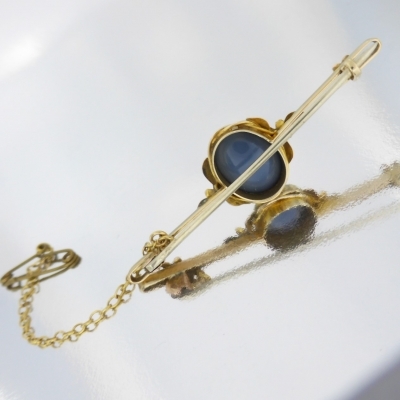 Pin works very well. 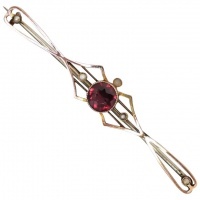 Also a safety chain/pin is attached to back- which provides extra security whilst wearing! 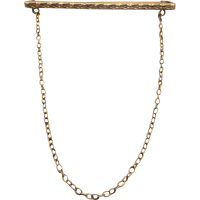 (pin to chain is not gold). 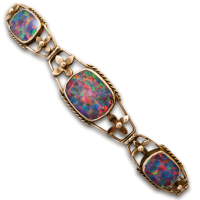 Gemstone: Opal Doublet, oval 12.20mm x 9.20mm; predominantly blue/green colour with strong play of colour, full spectral colours seen- bright flashes of orange, red, purple and yellow. 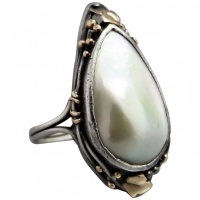 Whitish vein-like inclusions and potch/backing to one end of opal.